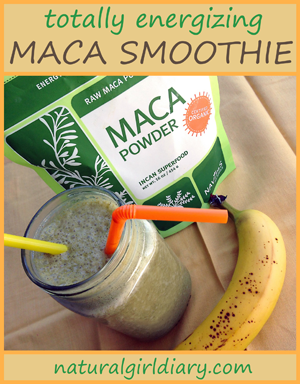 Maca is an Ancient Incan Superfood. The brand I used in this recipe is by Navitas Naturals and is non-GMO, raw, vegan, kosher, and organic. "Maca root has been used by indigenous Andean societies as a source of nourishment and healing for thousands of years. Studies have identified four alkaloids present in maca known to nourish the endocrine system. Maca root has been used as a stress-fighting adaptogen to increase stamina, boost libido, and combat fatigue. Maca is a nutrient-dense whole food packed with vitamins, plant sterols as well as many essential minerals, fatty and amino acids." Blend all ingredients on high and serve. Makes 2 servings. * Tip: to make it colder, use frozen bananas or add cup of ice.